Please, folks, take care of yourself with this heat. Patrice! I am sooo jealous! I live in NC and we are expecting 97, 99, 99, 99, 97... for the next 5 days. :( Enjoy it over there! Same here Mark, we are expecting temps in the low 100's over the next few days and then it will drop down to a pleasant mid to upper 90's here in Missouri. We're managing for the moment. Two days ago I had to be outside for an unmissable event for 14 hours. (Income producing.) It got up to 98. I went through LOTS of ice water and cool-wet washcloths. I had a battery-powered fan and a spritzer and thankfully was in the shade. By the end of the day I was still dehydrated even after drinking over a gallon of water throughout the day. When I realized I was getting dehydrated, I drank even more and felt better about an hour later. The long ride home in an air conditioned car has never been so appreciated! I don't have to be outside now for another week or so. The heck with the weeds in the garden. They win this round. 103 degrees expected today. And that is cool for us this time of year. We visited Idaho earlier this summer, and haven't forgotten how incredible the weather was there. We had hoped to be moving there, but the deal fell through. We're in the extreme heat this summer, and boy we sure do wish something else would open up for us out there to give us a chance to get away from this heat and humidity. This time of summer is hard. Praying for those who have to work out in it. Do be careful to drink, not just water, but also some electrolite-replenishing drinks (powerade/gatorade). We had to make a trip to the emergency room this week when my 14-year-old had to be treated for heat exhaustion while at camp. He had to have IV treatment. Heat exhaustion is bad, scary stuff!! And he had no strong early warning signs that he was getting that dehydrated and overheated. His episode occurred around midnight after a day of running, recreation and regular camp activities. I've lost about 10% of my plants this year (due to the extreme heat). Miraculously, I have been able to grow a nice garden despite more than 30 days of triple digit temperatures. Our highest temp so far was 112 degrees, and most days are 106 degrees. Going to change our state's name to "Okrahoma"! I look at your weather forecast, and have to remind myself at least three times that envy is a mortal sin. I honestly would LOVE to live where you are. What is "normal" for temperature is really what you are used to. In our part of Washington state it often gets into the 90's and even 100's every summer. This summer as well as last summer has been very cool. Only getting into the high 80's and low 90's so far. 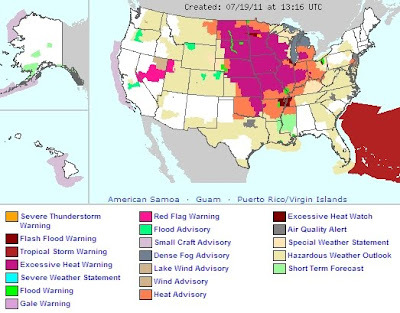 But growing up we never had "severe heat" warnings when it got up in the 100's. It was just the way it was, really hot. Stay in the shade, drink lots of water, and don't do excersise in the hottest part of the day. Now we have all these warnings. What makes the heat now more "deadly" now than it was back then? Those on the West Coast have my sympathy. I hate the heat! I certainly don't wish anyone or any part of the country bad weather but you have to laugh at the media reporting "heat waves" in the summer and "snow storms" in the winter. I have lived in every part of this country and indeed some places have bad weather. They have this bad weather every year and have since we began recording the weather. Let me make a prediction: Next winter the cable news will breathlessly report "snow" in New York or Boston with blizzards in the midwest. And they reporter/weatherperson will do so with a serious look on their face as though it was totally unexpected. Hey, I'm on a roll. Let me predict we will see reporters in Florida in a hurricane trying to stand up while being pelted by rain and high winds declaring he has never seen it so bad. Hee hee, Anonymous! I always laugh when they show a stop sign wobbling slightly back and forth and talk about the "high winds." That happens in a regular old summer storm in Florida. Just wish my husband didn't have to work out in it all the time (with little chance to cool off during the day), but he likes it a whole lot better than winter. Even my youngest son gets a long (about 4 hours) break in the middle of the day from his internship - roofing. Current heat index is 106, 115 is predicted for tomorrow. Interesting that the Oklahoma and Texas panhandles are not under any kind of warning. They are usually the hotter parts of the two states. We DO have heat warnings in Tulsa, OK! That's NE Oklahoma, y'know. Tulsa, OK-16 days over 100 degrees,plus 4 more days! Oklahoma City, OK-28 days over 100 degrees, more to come! Going outside is like opening your oven or standing in front of your hair dryer. You know you are a prepper when you think that people in the midwest should start using solar cookers and panels to take advantage. There has to be some use for all that heat! northeast mississippi is hot and humid. it usually is "hot hot hot", and it seems it is always humid.....the humidity makes it feel hotter and colder depending upon the season. when it is this hot i cut the grass and any other outside work at dawn. at least between dawn and sunrise it is cool enough to get small jobs done. after sunrise it is time to go inside, take a little nap and then do inside airconditioned jobs. During the summer, I become Mexican. Siesta during the hottest part of the day, dinner after sundown, 'cause it's just too hot to cook before then. Here in Houston, our summer started early. With two record breaking days of 105 in early June, we are doing a good job of melting down here. I feel for the folks in the northern climates of the US as they are not so used to it as we are. I drink about a gallon of water a day plus some electrolyte and I don't even work outdoors. I hope everyone can manage to drink plenty of water and stay as cool as possible. One caveat; just imagine there was no electricity to power the A/C or fans! We are melting in KY! Out in the barn, I didn't know eyelids could sweat and it could roll off of them as well! !